I was doing some research on Silverlight charting solutions for SharePoint when I stumbled across VisiFire an open source self contained charting solution built with Silverlight. If you haven’t seen VisiFire before, it’s worth checking out, their gallery page shows a number of really slick animated charts that are dead simple to use with XML data (without writing any Silverlight code). Add the Data View Web Part to you page. You can use SharePoint Designer for this, with a Web Part Zone selected, from the top menu click Data View > Insert Data View. From the Data Source Library in the right hand task pane select your list and click Show Data. Then select both the Title and Value fields and add them to the Data View. Save the file and refresh the page in a browser and you should see a pie chart come to life animated. If you make any mistakes the VisiFire widget is kind enough to give you a line number and position where it blew up, so that can be a help in tracking down typos in the notoriously picky XSLT. From here you can check out the other charts and other options via the VisiFire documentation which btw is really easy to read. Works great now–Thanks for the great post! I’m close. I get the chart title, and legend, but no values and pie chart is not displayed. I verified using the dataview in SP Designer prior to modifying the code. I originally created the list with Title and value (lower case). I modified the list, but the designer kept putting in a lower case v. I deleted the list and re-created. Problem resolved. Hi there. 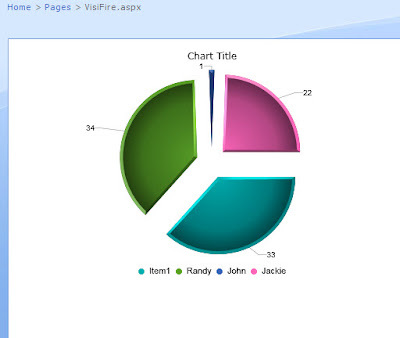 I have a chart working fine on a web part page using the data view web aprt. The problem I having is that I am trying to add another chart on the same page using a data view web part. The end result will be mutiple charts on one page. Is this possible? The first chart I added to the data view is the only one rendered. figured it out. This section of code needed to be updated according to the number of charts I wanted on the page. Many thnaks you saved me many hours. Has any one got this working with a SQL data view ? I am also using Jan’s web part with success but need to add more chart functionality and don’t fully understand the XAML file he uses. © 2019 Randy Drisgill — All Rights Reserved.